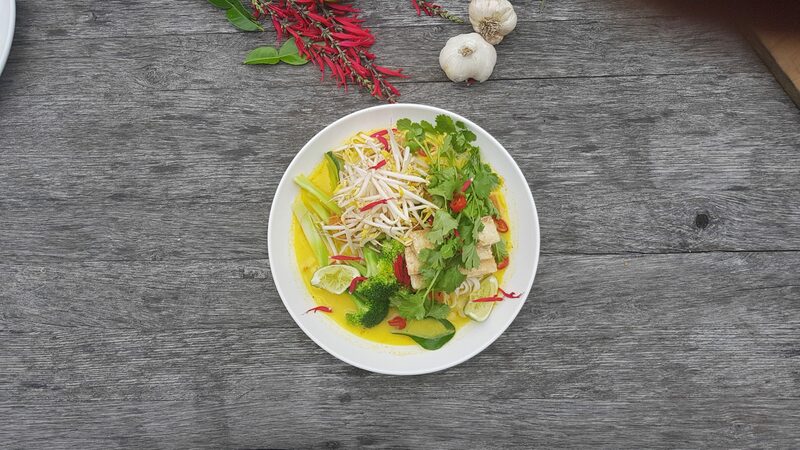 Our laksa paste is packed full of flavour, we picked the lime leaves Friday morning, super fresh. Bring a large pot of slightly salted water to boil. Keeping the broccoli whole, peel the stalk, then cut off the florets through the stalk, creating long pieces. Place the tofu on paper towel (or a tea towel) and press between two plates putting 5 kg of weight on top. Dice the tomato into rough 1 cm cubes. Cook the broccoli in boiling water for about a minute, or until just cooked. Keep the water on, but remove the broccoli and cool under running cold water. In a medium pan, sweat the onion in a little oil for 2 to 3 minutes, until just starting to brown. Add the curry paste and cook for another minute, stirring regularly. Add the chopped tomato and continue cooking until the tomatoes are cooked right down, about two minutes. Add the water and bring to a simmer. Add the coconut cream and gently simmer. Taste and season with salted, as needed. Cut the tofu into 1 cm long strips. Gently toss in cornflour, then fry on high heat in a good splash of oil until crispy. Transfer to a paper towel and season with salt. Cook the noodles for 60 to 90 seconds, until soft. Strain, then place in serving bowls. Drop the broccoli into the curry to warm through. Place tofu and broccoli on top of the noodles and pour over with soup. To serve, top with bean sprouts, coriander and a squeeze of lime juice.